We’ve been jamming Sucre du Savage for the last while over at the Deadquarters and we can’t wait for Quintron & Miss Pussycat to roll through town. Oh, we hadn’t mentioned that they’d be coming to town yet? Well, they’re coming June 12th [Sorry Bonnaroo-ers, looks like you’ll be stuck with Widespread and Smith Westerns… yuck] Miss Pussycat’s got her puppets packed up and recovering from a recent bender they went on [check out the video after the click] and Quintron’s got his drum buddy and a heap of good vibes ready to hit Nashy. They’ll be playing The End alongside Chicago’s CAVE and your favorite Turbo Fruits and Bows & Arrows. Gonna be a Sunday night dance party. If you haven’t picked up Sucre Du Savage from Goner yet, please do so here. 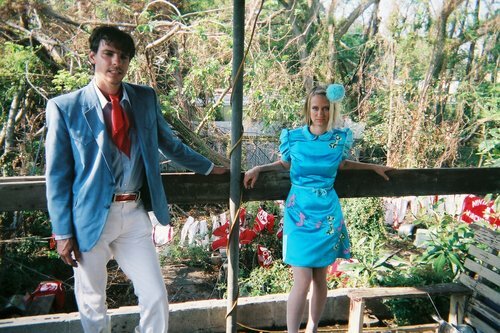 Aaaaand almost imediately after announcing this show, Quintron and Miss Pussycat have announced that they’re having to cancel all their current North American tour dates. This is such a bummer, but these things happen. We’ll just have to wait until the next go ’round and get our fill of drum buddys and puppet friends then.